Male announcer: This presentation is brought to you by the friends of the Amazing Facts Ministry. Doug Batchelor: "At that time of the end," by the way, that's when we're living now, "the king of the South will attack the king of the North." Now, this may not happen next year. It could happen in a month. I don't know when it's going to happen, but I don't think the prophecy is going to fail. I think it's going to happen. Announcer: For over 40 years, "Amazing Facts" has been dedicated to sharing God's Word through media. This program features highlights from some of our best television broadcasts. We invite you to sit back and enjoy this edition of, "Amazing Facts Presents." Doug: Our presentation today is going to be the third and, God willing, the final part in a three-part series dealing with the subject of Islam, Christianity, and prophecy and today's message is more specifically called, "Critical Mass." Join me in the book of Daniel for a moment, and I'm not going to stay here long, but I just want to introduce where I'm going. Daniel 11, verse 40. "And at the time of the end the king of the South shall attack him," the king of the North, "and the king of the North will come against him like a whirlwind, with many chariots, horsemen, and with many ships; and he will enter the countries, overwhelm them, and pass through. He'll also enter the Glorious Land, and many countries will be overthrown," he's talking about whole countries, "but these will escape from his hand: Edom, Moab, and the prominent people of Adam--Ammon. And they'll stretch out his hand against the countries, and the land of Egypt shall not escape. And they'll have power over the treasures of gold and silver, and over the precious things of Egypt; also the Libyans and Ethiopians will follow at his steps." Those are some verses that we're going to delve into today. It's very mysterious. Says, "At the time of the end." What is this talking about? We know those verses there, from 40 to 45, are very important, because if you read the next verse, "At that time Michael will stand up, the great prince who stands over the sons of your people; and there will be a time of trouble, such as there never was since there was a nation, even to that time." Jesus speaks about this great time of trouble such as there never has been. "And at that time your people will be delivered," the ultimate deliverance, "every one who is found written in the book," the book of life. "And many of those who sleep in the dust of the earth will awake," a resurrection. So, it's pretty clear that when Michael stands up that it's over. You get the resurrection. You get this time of trouble. You get the great deliverance, so what's happening just before that? Well, I think it's going to represent a showdown, where the tensions that have simmered from the time of Abraham and throughout the Christian era are going to reach critical mass. But before we get there, I'm going to ask you to join me in the book of Revelation. We're going to go back where we left off last time. Go, please, to Revelation. It talks about the last three trumpets, which are also identified with three woes. Revelation 8:13, "I looked, and I heard an angel flying through the midst of heaven, saying with a loud voice, 'Woe, woe, woe to the inhabitants of the earth, because of the remaining blasts of the trumpet of the three angels that are about to sound!'" So, the last three trumpets in the seven trumpets of revelation, they're-- well, let me say this. You got several sevens in Revelation. Got seven churches. Covers the history of the church from the time of revelation, first coming of Jesus, to the second coming of Jesus. It's a spiritual history. You got the seven seals in Revelation. It covers the political history that influences God's people from the First Coming to the Second Coming, and then you've got the seven trumpets. They cover a military history from the First Coming to the Second Coming: battles and forces and powers that would be at odds. And it's not talking about all the kingdoms and all the wars of all the world. You wonder, "Does this prophecy talk about China or the Inca Indians? Or does it talk about the-- you know, some of the other nations?" No, it's dealing with the nations that would have a direct impact on God's people and the proclamation of the gospel, so it starts in Israel. It expands from there, through Europe, where the gospel spread and it became the foothold, makes its way to America. Are you aware that America sends out more missionaries than any other country in the world? That more mission dollars come from America than any other country in the world, so it shouldn't surprise you that these places that have been the guardian of the message are the ones that are principally mentioned in prophecy. So then, these three prophecies, if you look, for instance, we're going to go next to the rise of Islam, and if you read in Revelation 9-- go in your Bibles. You turn a little bit over, and it's talking about that next trumpet. "And the fifth angel sounded: and I saw--" This fifth angel is the first of the three woes. "I saw a star fall from heaven to the earth. To him was given the key to the bottomless pit. He opened the bottomless pit, and smoke arose out of the pit like the smoke of a great furnace. So the sun and the air were darkened because of the smoke of the pit. Then out of the smoke locusts came upon the earth." Now, I read to you last week-- if you read in Judges chapter 6, it talked about when the Amalekites and the Midianites and the people of the East covered the land like locusts, with their camels. These are the people that comprise the Arabs, and it describes them as locusts, and they ate everything in the land. That's why Gideon was threshing wheat secretly, because there was no food. The locusts ate it all, the Arab enemies at that time, and so this would not be the first time there was a battle between these two peoples. So, here this smoke coming out of the pit is describing the birth and the spread of the religion of Mohammed, and this is the first trumpet or the first woe of the fifth trumpet. Most Christian expositors, Martin Luther, Sir Isaac Newton, historian Edward Gibbon, and many others all saw the fifth and the sixth trumpet in Revelation 9 as the rise and the spread of Islam and its battles with the eastern and western Christian world that was growing there through Europe. So, Revelation 9:1-12 is the fifth trumpet and the first woe. It's the rise of Islam, and it says they would torment-- there's a number associated with it. They would be tormenting Christianity. They didn't kill them. They tormented them like the sting of a scorpion-- it's not a deadly serpent-- for five months. Now, when we look at these Bible prophecies and there's a time period, what's the principle we use? A day is a year. A biblical month had 30 days. That's why the 42 months comes to 1,260 days, because they're 30-day months. It's the only way those two could be reconciled. That's 150 days in 5 months, right? A hundred and fifty days. A day is a year, 150 years, and it started in 1299 at the Battle of Béthune. The Turkish Muslims began a persistent assault on the Eastern Roman Empire in Constantinople. In 1449, exactly 150 years later, the conflict of the Eastern Roman Empire, or Byzantine Empire. It became a vassal state. It submitted to the Ottoman Empire, which was a Muslim power, exactly what the prophecy said would happen. Now, you go to Revelation 9:12. It says--the angel doesn't want us to lose track, so he says, "One woe is past. Behold, two more woes," to make up those three, "are coming." These woes, the first two woes, are a battle between Christianity and Islam. Could it be the third woe is more of the same? That's what I'm putting forth. Now, if you read in Revelation 9:14, it talks about four angels, and it says these four angels-- and I'll read this to you. "Saying to the sixth angel who has the trumpet," so this is the sixth trumpet, he says, "'Release the four angels who are bound at the great river Euphrates.' So the four angels, who had been prepared," and you got another time period here, "for the hour and day and month and year, were released to kill a third of mankind." This represented a different woe, a different phase of battles that lasted over 300 years between Islam and Christianity, where now they started attacking the Western Roman Empire, and they basically had already swallowed up and conquered the Eastern Roman Empire. This is the sixth trumpet, or the second woe. Let's look at the time period here, and I'll have the numbers up on the screen for you in just a moment. You got a day and an hour. You got an hour, a day, a month, and a year. Well, an hour, even in the Bible there were 24 hours in a day. You can read where Jesus said, "Are there not twelve hours in a day?" And so, you got 1/24 of a day, or 1/24 of a year is exactly 360 days to the Jewish year. That's going to be 15 days. Then you've got a day, which is one day. Then you got a month, which is 30 days. And then you have a year, which is 360 days. You add all that up and that comes to 391 years and 15 days. This is incredible because if you start at that earlier starting point of 1449, it extends to 1840, and at that point the Ottoman Empire lost its independence and authority. It requested help from other European nations to continue existing, and what's incredible this is one of the rare times in history. Most of the time we understand prophecy clearly, looking back. Jesus said, "When this comes to pass, then you will know." And so, we're always trying to use prophecy to say what's going to happen. More times than not we say, "Oh." After it happens we go, "Oh," but this is one of the rare times in history where somebody studied the prophecies and predicted in advance what was going to happen, and it happened. How many of you have read about Josiah Litch? And when he studied this prophecy back during that great Millerite movement when they were anticipating the Lord's coming, he predicted, using the day-for-year principle, the Ottoman Empire was going to fall and even predicted the date it would fall based on the date it started, and it happened. Well, that really inspired everybody else that 1844 was a good date, which it was. They just had the wrong event. Doug: Don't go anywhere, friends. In just a moment we'll return for the rest of today's presentation. Did you know the Bible has a prophecy that perfectly predicted the time of Jesus's first coming and even the time of his death? No prophecy in Scripture is more vital, yet few Christians are even aware of it. Well, we have a free gift for you today that will help explain this prophecy in detail. It's titled "Right on Time." In this fascinating study you'll also learn how God precisely foretold the date of Jesus's crucifixion and the powerful prophetic clues proving his return is near. 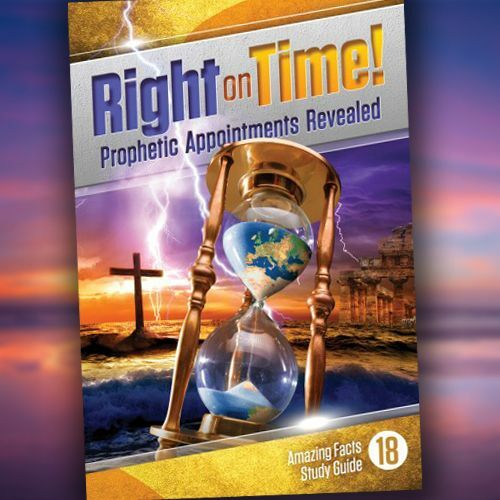 To get your free copy of, "Right on Time," call the phone number on your screen and ask for offer number 131, or visit the website. And after you read this incredible resource make sure and share it with your friends. Well, let's get back to today's presentation and learn some more amazing facts from the Word of God. Doug: Go to Revelation 9, and we're going to be reading the verses from 13 on. "Then the sixth angel sounded: and I heard a voice from the four horns of the golden altar which is before God, saying to the sixth angel who had the trumpet, 'Release the four angels who are bound at the great river Euphrates.' So the four angels, who had been prepared for an hour, a day, a month, and a year, were released to kill a third of mankind." Now some are wondering, "What does that mean, a third of all humanity?" Well, it was maybe as many as a third of the soldiers involved in the battles over this 300-year period, or 391-year period. That would have been more accurate because the armies of Christianity was decimated during this time. "So the number of the army of the horsemen was two hundred million." Now, every commentator I've read on that said, "We're making a mistake here." Now, I don't know-- what does your Bible say? King James is--yeah, and here I'm reading the New King James that says "200 million," and many other versions put that. The reason is that number is actually two myriads of myriads. The problem is the word "myriad" is an end-- it's unprecise number. Matter of fact, in the book of Acts, I think it's chapter 20, it said, "Myriads of people came to hear the word of God." Well, it wasn't a hundred thousand, so you'll see that word is sometimes used as an indefinite number. It may sometimes mean 10,000 and sometimes it can mean 100,000. William Miller, who I agree with on this, he believes that that number was saying 2 times 200,000. That would be 400,000. Well, it is interesting that in the siege of Constantinople the--Mehmed had an army that numbered at least 350,000, and so it's talking about this incredible army on horseback, but it's not necessarily giving you a specific number. And it says, "And thus I saw the horses in the vision," he used, principally, cavalry, "and those who sat on them had breastplates of fiery red, and hyacinth blue, and sulfur yellow." They did wear iron breastplates, and they did have blue garments. "And the heads of the horses were like the heads of lions; and out of their mouths came fire, and smoke, and brimstone." Now, many of the-- many historians believe this is describing the introduction of gunpowder. The Muslims were some of the first who began to take from the East the knowledge of gunpowder and use it in warfare for cannons and arms. They were primitive rifles, but they saw the smoke and the fire and the brimstone firing out of the front of these horses, and they'd turn around and fire behind them, like a good Cheyenne soldier, and they'd see them coming from the front and the back, and they'd hear the roar of a lion they couldn't describe. Arrows don't make that noise when you shoot them, and so it's talking about it's like a roar coming, and you can read this. "Out of their mouths fire, smoke, and brimstone." And I think that this is describing some of the early firearms. I've actually got pictures, I think, that you can see here on the screen, one artist's rendition of an early Ottoman cannon. Yeah, there you have it, and then some of the smaller arms of the--even the early paintings you can see that the Ottoman soldiers, they did have primitive guns that they used back then, and I thought, "Well, maybe he was describing this in vision." Now, we get to the seventh trumpet, the third woe, and right now, friends, just in case you're wondering, up until this moment I've been talking about what's behind us. Now I'm getting ready to talk about what's ahead of us, or we're on the threshold of right now. "The seventh angel sounded: and there were loud voices in heaven, 'The kingdoms of this world have become the kingdoms of our Lord and of his Christ, and he will reign forever and ever!'" "And the nations were angry, and your wrath has come." It's talking about a time of unprecipitated international turmoil. Not a nation, the nations. "And your wrath has come," a time of judgment, "a time that the dead, that they should be judged," a time of judgment, "and that you should reward your servants," it's a time of reward, "and the prophets and the saints," and that would be a resurrection. This is similar with what's happening in Daniel 12 and the end of Daniel 11, "Those who fear your name, small and great." And so, with that introduction now, I'm going to jump to Daniel 11. Now, I should tell you, as we go there, I don't have time to read all 45 verses and expound on them, but I'm going to just show you--I'm going to cherry pick a few verses, I'll just be honest with you, that are pretty easy to understand so that we can get to the verses we're considering. For instance, if you look in Daniel 11, verse 2, "And now I will tell you the truth: behold, three more kings will arise in Persia, and the fourth will be far richer than them all; by his strength, and through his riches, he will stir up against the realm of Greece." You've heard of Artaxerxes and history calls him Xerxes I, and this king--any of you ever heard the story about the 300 Spartan soldiers that were able to resist the Persian advance? This is the Xerxes who had an army that they say numbered somewhere between 600,000 and 1 million. That is a massive, massive army. He invaded Greece, but he didn't succeed in taking it, and he was very rich, and this is what is being described here in Daniel 11, verse 2. And jump over now to verse 3, Daniel 11:3, "Then a mighty king will arise, who will rule with great dominion, and he will do according to his will. And when he has arisen, his kingdom will be broken and divided towards the four winds." Who do you think this is talking about? That's right. It's Alexander the Great, who was a mighty king, incredible general, very young, considering what he accomplished, and he came from the North. Matter of fact, several of these kings, you're going to find out, are coming down from the North. All right, talked a little about Alexander the Great. Go in Daniel 11 to verse 20. It says, "There will arise one in his place who imposes taxes on the glorious kingdom." Well, this is really easy to figure out, because you find the answer to who this is right there in Luke 2:1, "Came to pass in those days there went out a decree from Caesar Augustus that all the world should be taxed," and that's exactly what Augustus Caesar did. Matter of fact, it's mentioned twice in the Bible. Look in Acts 5:37, "After this man, rose up Judas of Galilee in the days of the taxing." It was so big. The taxing he did was, sort of, a universal taxing that it had a high point in history, so the Jews referred to it, "Oh yeah, the days of the taxing." And Augustus Caesar, he basically took a census of the whole kingdom so that he could accurately impose taxes on everybody and talks about him in Daniel 11, so now we've transitioned, you can see, to where the Romans have replaced the Greeks in the North. Then you get to Daniel 11:25, "He will stir up his power and his courage against the king of the South with a great army. And the king of the South will be stirred up to battle with a very great and mighty army; and it shall not stand, for they will devise plans against him." Many commentators believe this is describing when now the Roman power has transitioned into the Roman church after Augustus Caesar, about the time of Justinian. That Christianity was legalized during the time of Constantine and now it's transitioning more into a spiritual kingdom in the North that's fighting with a spiritual kingdom in the South, Islam, that had taken the Holy Land, namely, the Crusades are being described here. Mighty armies crossing the ocean. The king of the North against the king of the South, but don't miss that it starts out talking about political battles and kingdoms, but when you get into the time of Jesus, it starts turning into spiritual kingdom, because the nation of Israel-- Christ said, you know, "My kingdom is not of this world." He said, "The kingdom of heaven is at hand," and now it became a battle for who has the truth. The whole purpose of the beast power--have you read Daniel 8? Cast the truth to the ground and practice and prosper. Cleansing of the sanctuary is restoring of truth about God, as well as many other things, so it's--this is all dealing with the big battle for the truth, because the truth is what saves. It's the gospel that sets people free. Now we're getting to the main passage that we can-- we considered earlier. "Now at that time," this is a prophecy of the end time, "at that time of the end," by the way, that's when we're living now, "the king of the South will attack the king of the North." All right, I think the king of the South is Islam. I just look at what's happened through history. The first woe. The second woe, it was the spread of Islam. The third woe. Why did the prophet separate out those three woes? Is the battle between the sons of Ishmael and the descendants of Isaac, that are now the two great religions of the world today, and it is a very powerful, wealthy, growing religious power, but it's not the truth. And something is going to happen. Now, if you say, "Pastor Doug, what's the attack going to look like?" I don't know. Some might have thought it was the twin towers, but I think it's going to be bigger than that. Something is going to happen. You know, right now the leaders of the Western world are very conciliatory towards Islam because they know that if there's an incident--that the feelings between the people of these varying religions, these two principle religions, are growing threadbare, and if there is some major assault--what would it take? I don't know, but I'm saying that there could be some event that would trigger--you know, if the flow of oil is somehow cut off, people will put up all kinds of things on the news. People will watch about different terrorist things that are out there happening to other people. I heard someone say once, "When you're out of a job it's a recession. When I'm out of a job it's a depression." And as long as it's out there somewhere--but if all of a sudden you can't buy stuff at the store, and you can't get your gas at the pump, you're going to--and someone in politics says, "You know, we need to get a force together. We need to get a coalition from Europe, and we need to put an end to this," folks are going to go, "Yeah, if it's going to put gas in my tank let's do it." And if we're outraged because we feel like Christianity is being attacked or our way of life is being attacked, but something is going to where it says the king of the South will do something to provoke, some major incident, the king of the North. Don't know exactly what that will be, but the king of the North is not going to sit by anymore and talk about peace. You read here it says, "The king of the North will come against him like a whirlwind." You know, my guess is that when this coalition of powers from the North, Christian coalition different from the other Christian coalition, that a confederacy. They're going to say, "Israel is our friend." And because, you know, if there's this great Islamic struggle against the West, there will probably be an attack on Israel at the same time, and they will use that as an excuse to protect our Jewish friends. They will enter the Promised Land literally. I really think that may literally happen. I tell you there is nothing more--that a lot of Arab countries--not all, but many of these Arab people and countries would love to see Israel displaced. They won't even acknowledge them as a nation. That would be a good excuse for this military to come in and create a beachhead there. "The North will come against him," I'm in Daniel chapter 11, still verse 40, "like a whirlwind, with chariots, and horsemen, and many ships." This can't be understood. Now, I doubt, you know, we're going to have chariots. There'll probably be Humvees and tanks and, you know, they're trying to describe moving massive military, but a great confederacy of military. Many ships and a navy will enter the countries. Not country, countries. This might be some of the Islamic countries, but you realize it's not just terrorism that's happening in Europe and America. It's in Africa. It's in India. It's in Indonesia. It's in the Philippines. Everywhere I've gone in the world, they are having friction with their Muslim neighbors. Now, this may not happen next year. It could happen in a month. I don't know when it's going to happen, but I don't think the prophecy is going to fail. I think it's going to happen. Announcer: Did you know that Noah was present at the birth of Abraham? Okay, maybe he wasn't in the room, but he was alive and probably telling stories about his floating zoo. From the creation of the world to the last-day events of Revelation, biblehistory.com is a free resource where you can explore major Bible events and characters. Enhance your knowledge of the Bible and draw closer to God's Word. Go deeper. Visit biblehistory.com. Doug: The heavens were parted for him. The Holy Spirit came down. This is what God wants you to experience. If you come to Christ, your sins are washed away, you become a new creature. It's a land of beginning again, and how many of you wish you could get a new start? Announcer: "For I was hungry, and you gave me something to eat. In as much as you do it to one of the least of these, my brethren, you did it to me."